Phantasy Star Online 2 is an online multiplayer RPG where up to 12 players can cooperate in a quest to defeat various bosses and enemies. 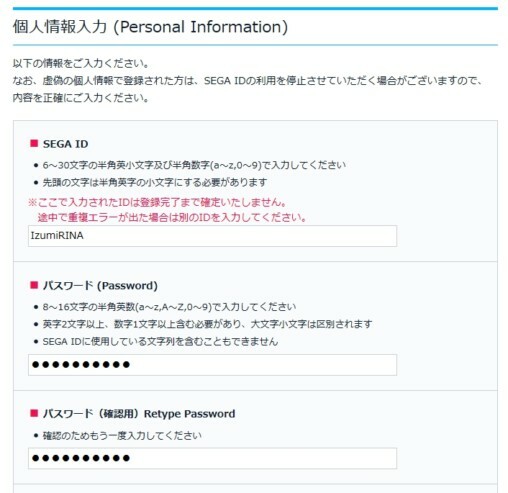 In order to access the online servers, you’ll need a SEGA ID. This registration guide will outline the entire process, helping players embark on their infinite adventure. PC players may download the game for free at the official site, by clicking on the large button with the space background at the top. Alternatively you can torrent the game from Arks Layer which includes a set up file with several updates pre-installed. You can also download an English Patch by installing the Tweaker from the Arks Layer website. PlayStation 4 players can download the game for free at the Japanese PlayStation Store. It is recommended that you familiarize yourself with the PC version’s English Patch before attempting to play the PlayStation 4 version. An English Patch is not available for the PlayStation 4 version. If you receive this message, the registration page is blocking access from your location. You will need a proxy or VPN to continue registering. 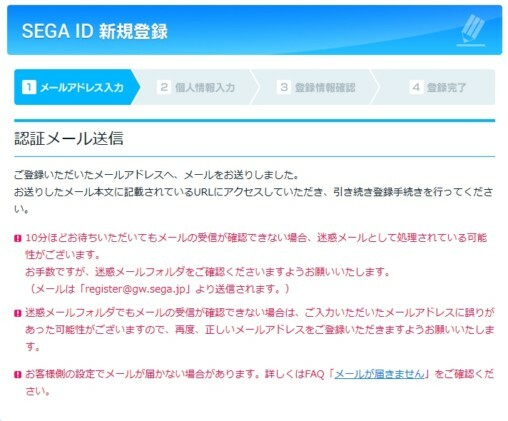 If you receive this message, Sega is currently having hardware issues and has temporarily closed all new registrations. Certain territories are blocked from playing the Japanese version. Generally, if you are unable to access the official site, then a VPN will be required to play. English players can be found on Ship 2, Ship 4, and Ship 10. Ship 2 has the highest English speaking population. Head to the Official Site. 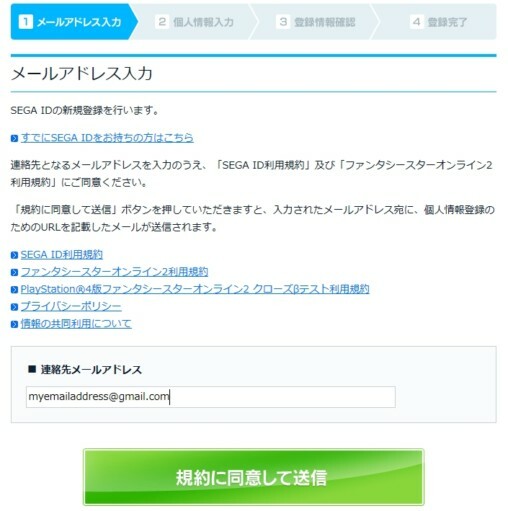 Click the SEGA ID button. Click the large button beneath the form. Please avoid registering with AOL email addresses as they have issues with receiving authentication codes. Check your Email and click the link inside. 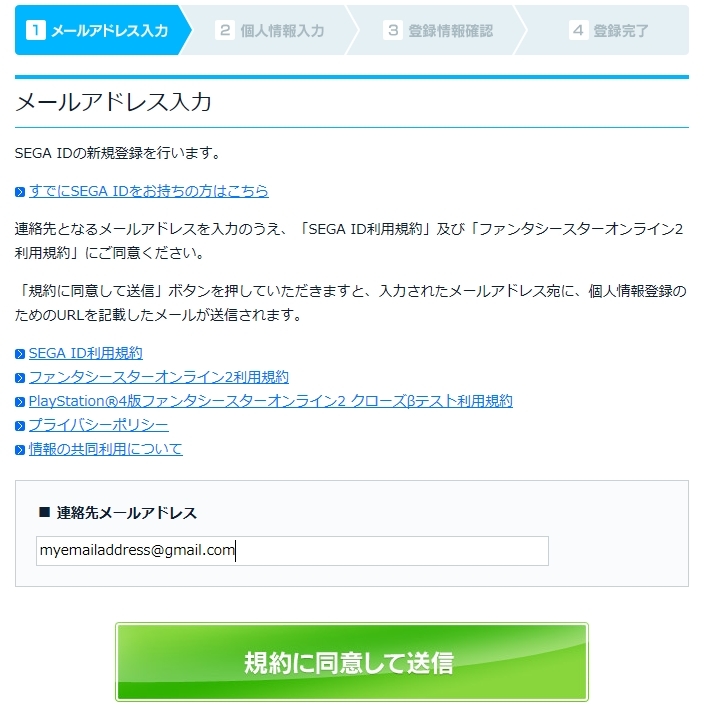 Type in your SEGA ID. You will use your SEGA ID to sign into PSO2. Your password must be 6 ~ 30 characters in length and must have at least 2 English letters and 1 number. Select Birth Year, Birth Month, and Birth Day. 通っていた幼稚園（保育園）の名前は？ The name of the kindergarten or nursery school you went to. 生まれた町名は？ The name of the town/city you were born in. 最初に乗った車の車種は？First Car Make or Model. 初恋の人のファーストネームは？ First name of your first love. 中学校三年生の時の担任は？Your third-year middle school homeroom teacher. Recovering a lost password requires that you enter a four digit year, two digit month, and two digit day. Checkmark if you want to subscribe to the Newsletter. Press 次へ for the next page. Solve the captcha by typing the “Hiragana” characters contained in the image. For further assistance, visit [Lexilogos Hiragana] to match the characters. Be quick as the captcha times out after a few minutes! If you need additional assistance, you can ask for help in a PSO2 Facebook group or on PSO-World. Press [登録する] to complete the registration! To make things a little bit easier, right click, copy the image location, and open it in a new tab. Refresh the image to see the Japanese characters in different angles. Seeing this page means you’ve completed your registration! Congratulations, you can now log into the game. how can i get sega id? Thank you for this guide. It was very helpful. I would also suggest using google Chrome for registering for its awesome auto-translate function. It gives me an error code not displayed at the email registration and the japanese proxy issue is not working. I think its asking you your name/date of birth or secret question you used in registration. Is there a dropdown list next to it and have you tried entering any of these? Hey! Been playing PSO2 since bumped launched. Just got back on using proxy stuff after DDos hit. However, I’m encountering an error involving me going to pso2.jp/reset when I try to access player shops. I’m pretty sure I have the right password, so I don’t know what’s up! I can’t connect to the main site either! Please help! Click on the large button at the top of the page to download the installer. 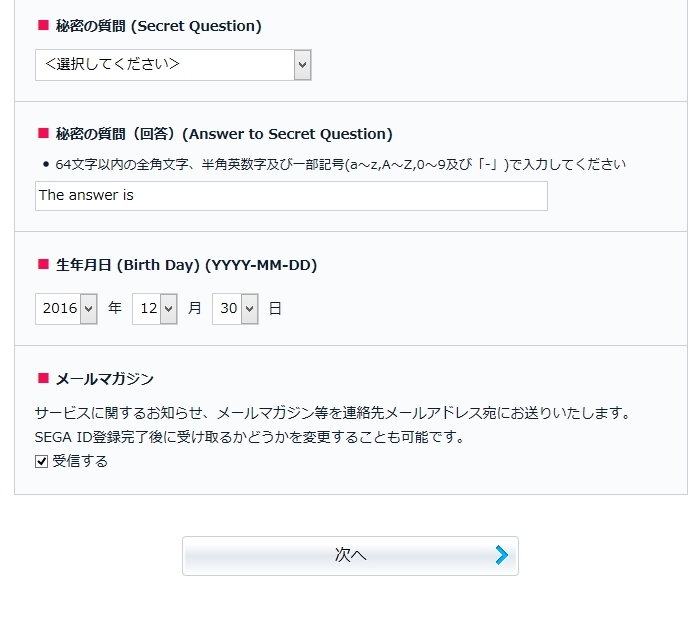 will help with them japanese captchas, just add me on skype or steam. 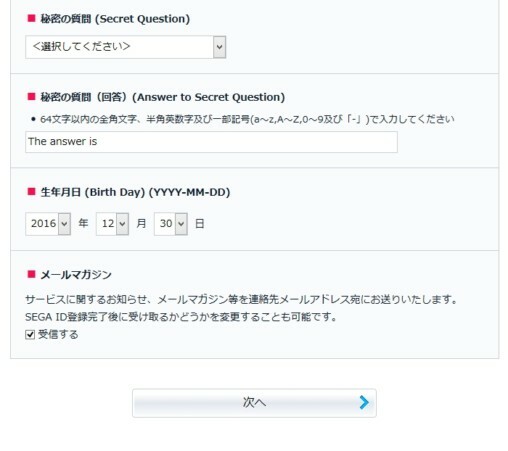 Ok, I don’t have a japanese proxy, and it considers my response to my secret question acceptable; even though it’s in English. Help? u can use free vpn or browser addon like zenmate(to activate it, you need to register). available both at Mozilla and Chrome add-on store. Damn man Ship 2!? If I knew this site a long time ago I wouldn’t be in Ship 6..
Hi, I recently register for the SEGA ID via sega.jp. 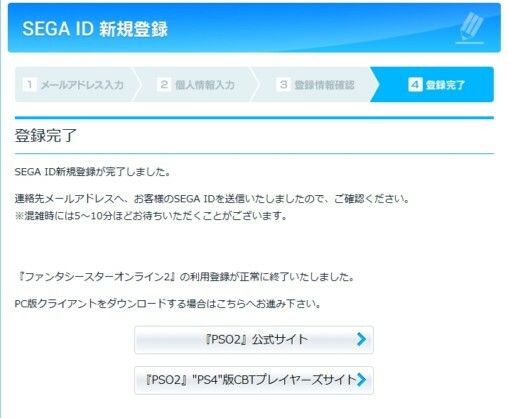 Can the ID be used and play on pso2 vita version? > English players can be found on Ship 2, Ship 4, and Ship 10. And ship 6 as well. just ship 2, ship 4, and ship 10 has the most english players. Ship 6 have some but most of them are JP players. there’s a decent few on ship 9 as well. not huge numbers, but I’ve been able to find some. I’ve found several actually, both by several teams and by pure coincidence like in EQs, but we have this standard of keeping down-low and not yelling in public chat in English, using just party or team chat instead. It’s nice this way because it’s respecting the Japanese players who don’t want to see English gibberish spammed in local. Cannot type the full captcha for some reason the text box seems to be limited. I forgot my password & secrect answer. I haven’t use my DOB since I reach my limit I am guessing… So my account is forever doom? I used the google chrome translation as well as the guide. The only problem that I had was the “Captcha” at the end. Had 2 fails due to server message on next page. I had gotten used to the characters at this point and registered on 3rd attempt. Use this site to translate your e-mail(s) after. Just copy from the e-mail and paste into left window here.